Light snow/rain redevelops tonight across PEI..
Sunday, January 27th 9:30am… A area of high pressure is currently moving across the northern Gulf this morning and is responsible for the light winds, but an area of snow associated with a NE-SW trough of low pressure also moved across the south half of the Maritimes. This trough and snow will shift east today allowing the snow to end and skies to partially clear. Snow will redevelop later this evening as a cold front approaches from the west and warm air surges north. The light snow will change over to rain showers after midnight tonight. The actual cold front is then expected to sweep across the island near dawn tomorrow morning allowing much colder air to flood the island on NW winds. High pressure will then build in from Quebec later tomorrow afternoon into Tuesday morning. A coastal storm will then track NE from Florida passing SE of Sable Island on Tuesday. 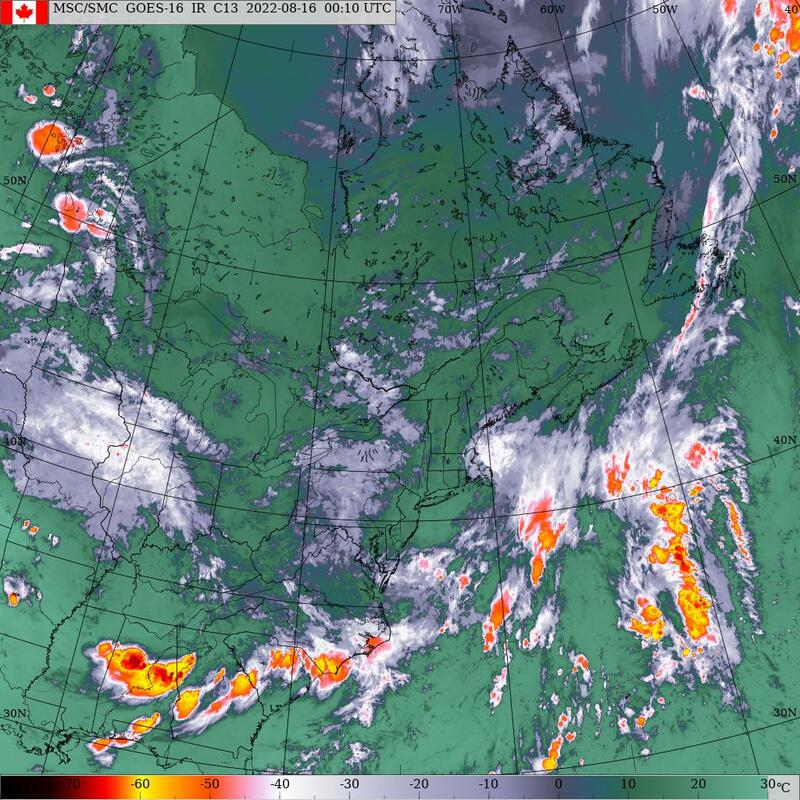 The precipitation shield may just clip the Atlantic coast of NS with only clouds expected here across PEI. Things begin to get interesting again. Low pressure will approach from Ontario later Tuesday. Secondary low pressure will then develop near southern Maine/Cape Cod early Wednesday morning. This new low takes over as the primary system and tracks northward through Maine and western NB during the day Wednesday. Warm air will surge northward on the east side of this system allowing snow to change over to rain by late afternoon. The associated cold front will then sweep eastward across the island mid evening Wednesday followed by a return to Arctic air. A secondary cold front moves through Thursday with a reinforcing shot of cold air along with cloud and flurries. This cold air will remain in place through the weekend with a large area of high pressure in control. Clouds will be on the increase on Sunday as the next weather system approaches from Ontario with snow by Sunday night. Precipitation.. Light snow or flurries this morning should end to towards Noonish. Snow or rain redevelop near midnight tonight changing to snow by dawn tomorrow ending by noon. Could get a few cms snow for tomorrow’s morning’s commute. Dry for Tuesday. Snow begins near noon on Wednesday giving about 5 cms before changing to rain by suppertime then ending through the evening. Light amounts expected. Snow on Thursday morning associated with the secondary cold front. Dry for Friday and Saturday. Snow cold begin by midnight Sunday night as the Ontario system approaches. Temperatures… Slightly above normal today and tonight. Temperatures plummet just after dawn tomorrow and staying cold tomorrow night into Tuesday. One-day warm-up on Wednesday. The cold returns Wednesday evening and remains cold Thursday through Sunday. Wind.. Light SE winds develop today shifting to NW near dawn tomorrow with the cold frontal passage. NW winds then diminish to calm tomorrow night and remain calm through Tuesday afternoon. Light SE winds develop Tuesday evening increasing to brisk Wednesday afternoon shifting to NW Wednesday evening behind the cold front. Light-brisk W-NW winds then continue Thursday through Sunday. Hazards. Wet/slushie surfaces will freeze tomorrow morning making the commute to work and school a bit tricky. Watch for ice formation. Same scenario for Wednesday evening. Tonight.. Light snow changing to rain after midnight, brisk SE winds, temps rising to +2 after midnight then falling at dawn. Tomorrow.. Rain changing to snow near dawn then ending by noon, diminishing NW winds, temps falling from +1 at dawn to -6 by noon then -10 by suppertime.